Global Warming - is it happening? At the present time, the jury is out. It was happening during the nineties, but now it seems to have stopped. But let's think for a few minutes about the problems of measuring the earth's temperature. There is no such thing as a mean global temperature. Think about it - every bit of the planet is at a different temperature. How could you possibly measure the average? Another problem is that water warms up more slowly than dry land; it also cools more slowly. So land and water are at different temperatures. G.I.S.S. (the Goddard Institute for Space Studies, a laboratory of the Earth Sciences Division of NASA's Goddard Space Flight Center) has been measuring temperatures for years, both in the atmosphere and at the earth's surface. What they do is this - they measure temperatures at a particular place for many years, and then take an average. Then they compare the year-on-year figures with the average, and plot this as what they call a 'temperature anomaly'. This means that figures from different weather stations, all at different temperatures, can be combined to give an overall picture of whether the earth is getting warmer or colder. A clever idea. For those that are interested, the vertical axis is in Centigrade, and "0" probably corresponds to a mean temperature of around 14 degrees. http://www.giss.nasa.gov/data - it's worth looking carefully at this site. So the answer is - temperatures were roughly static from 1880-1920; they went up slightly until about 1940. 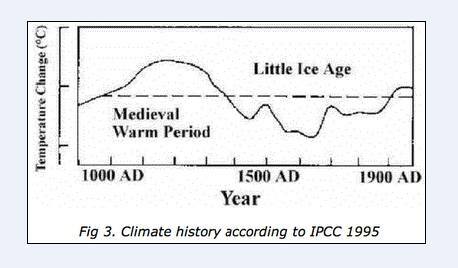 There was a period of cooling until the mid seventies; for the next thirty years there was a slight warming, and since the turn of the century the temperature has remained about the same.